The Echo Series of dwarf daylilies are selected for their large flowers on compact plants and for their ability to re-bloom after the main spring flowering in spring. Hemerocallis are among the toughest and easiest plants to grow, heat tolerant and able to handle seasonal drought and week-long rain. 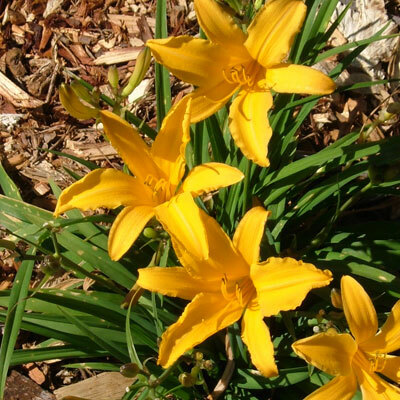 Whether mass planted in one colour or interspersed in a mix of colours or combined with perennials, shrubs or clumps of grasses, daylilies are fabulous plants for home gardens or commercial landscape planting. With their compact form and outstanding ability to re-bloom on and off through spring and summer, the Echo series will also make good pot subjects. When in bloom they can be moved into prominent positions to give splashes of colour. Cultivars in the Echo series have compact, iris-like foliage that is evergreen in most locations and will look attractive year round. Buds and flowers are edible and can be added to salads, used as garnish or in some Chinese recipes. Daylilies do best in full sun, but will perform in filtered sun. Once established daylilies need very little care. Prepare the garden bed well, working in plenty of animal manure or compost. After planting, water well and mulch the bed to conserve moisture and to control weed growth. Most cultivars will benefit from being lifted and divided every three or four years. Occasional fertilising after a bloom flush is beneficial.Once established plants need little supplementary watering, are fast clumping and will reward you with their attractive flowers in a myriad of colours. Each flower lasts only one day but is followed in succession by new ones, day by day, for several weeks. Hemerocallis originate from China and Japan and other parts of Asia, but have been extensively hybridised by breeders around the world. Despite there being tens of thousands of named varieties and a dizzying array of choices, daylilies have often only been available through specialty growers and mail order suppliers. The Echo series will make a good array of coloured day lilies more widely available.